The Nokia Lumia 925 has an 8.7MP camera that shoots 8MP photos (3264 x 2448) in 4:3 mode and 7MP photos (3552 x 2000) in 16:9 mode. This is the special sensor design Nokia has used since the N9, which loses only 11% of the resolution when going from 4:3 to 16:9 mode instead of the 25% that traditional sensors lose. Its primary advantage over the competition is the Optical Image Stabilization. It improves low-light performance by allowing longer exposure (the f/2.0 lens helps here too) and eliminates hand shake in videos. 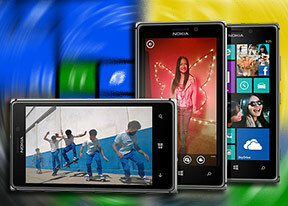 The Lumia 925 brings another upgrade over the 920 - its lens is has 6 elements over the 4 of its predecessor. In theory that should result in sharper images with more detail. The camera UI is pretty simple - you have your viewfinder and some controls on the right. From top to bottom they are the still/video camera toggle, front/back camera toggle, a flash mode setting and the Lens button. On the left you have an arrow that takes you to the images taken with the camera, alternatively you can swipe to get there. The shutter key will wake the phone up with a single press and launch the camera app. You can set Nokia's exclusive Smart Camera to be launched instead. We'll look at image quality in a later article, but we have to wonder why Nokia chose to limit Smart Camera photos to 5MP. Sure, Smart Camera shoots 16:9 photos, which eats into the resolution, but Nokia's sensor can do 7MP in this mode. We suspect the midrange chipset is the real answer. 5MP is not far ahead of HTC One's 4MP camera and without the benefit of large sensor pixels. It's also no match for the fine detail captured by high-end 13MP shooters either. Anyway, Nokia has other Lumia-exclusive Lenses too. There's the Panorama and Cinemagraph (creates animated GIFs), but also GlamMe (to enhance self-portrait shots) and a few more.